What an epic opener for a story about an egg! “Dimity Dumpty, the Story of Humpty’s Little Sister” by Bob Graham balances evocative, lyrical writing with an original, exciting, funny plot. and things that slide in the night. No light had ever caught Dimity in its bright glare. However, when she is needed, Dimity finds her voice and her courage. The illustrations are a great discussion point for perspective and size – you can see the wonderful contrast between Humpty and the soldiers and their horses – yes, “all the king’s horses and all the king’s men” do get a mention! Our own eggs for dinner were not quite as adventurous as Humpty or as musical as Dimity. However, they did look pretty! The instructions for the hats came from “Usborne Activities – Easter things to make and do”. 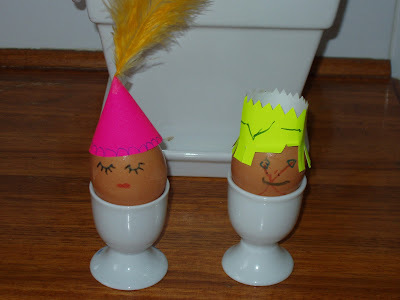 The hats were made in the time it took for the eggs to boil!